Roxanne Lapointe, right, a nurse practitioner with Landmark Health, discusses medications with Shirley Ehlers. Every month, nurses visit Shirley Ehlers' home in Oceanside, Calif., to help care for her multiple chronic medical problems and keep her from having to make an avoidable trip to the hospital. The nurses help Ehlers, a 73-year-old retired nurse with diabetes, asthma, heart problems and melanoma, manage her medications and coordinate care when needed. When Ehlers became depressed after a nursing home stay, a nurse set up a home visit from a mental health worker. After she fell and hit her head on a metal stool, a nurse came to her house to perform neurological follow-up checks during the next two days. And when she suffered from atrial fibrillation one night, she called a designated number and spoke with a doctor who advised her to take a double dose of her medication and called back in an hour to check on her symptoms. The reassurance of having a physician to speak with while experiencing scary symptoms kept Ehlers from a premature and costly emergency room visit, she said. Ehlers is enrolled in a home-based care program through her Medicare Advantage insurer, Blue Shield of California, which began a collaboration with home health provider Landmark Health this year to augment the role of primary-care physicians by sending an interdisciplinary care team to the home to aggressively manage patients' conditions and prevent complications. Home healthcare programs similar to Blue Shield's are proliferating as health plans and at-risk providers look for ways to keep patients out of the hospital or from returning after being discharged. As healthcare costs squeeze patient wallets and company bottom lines, insurers have focused on the savings to be reaped by caring for patients at home. And by removing some benefit restrictions, Medicare is making it easier for those health plans to do so. “The amount of services that are moving to the home is happening at the fastest pace I've seen,” said Bruce Greenstein, chief strategy and innovation officer at home healthcare provider LHC Group who previously served as HHS' chief technology officer. “The organizational alignment is occurring with the financial alignment and that's going to allow more innovation to happen in providing the right kind of care in the home,” he said. Home healthcare companies experienced explosive growth and innovation over the past five years as they've zeroed in on caring for certain subsets of patients, from the chronically ill to those with advanced stages of disease who aren't likely to get better. They each promise to reduce admissions, ER visits and costly complications for the health plans they contract with. Dr. Scott Mancuso, Landmark's chief clinical officer, said the company is bringing back the house call of the old days but “more advanced than a black bag and a stethoscope.” Its teams of physicians, nurse practitioners, nutritionists, pharmacists, psychiatrists and social workers provide resources at home or via telehealth around the clock for chronically ill patients. Health plan clients see a 30% reduction in hospitalizations within the first six months among patients who engage in the program, Mancuso said. Turn-Key Health, meanwhile, provides home-based palliative care to seriously ill individuals in the last six to 12 months of their lives who are at high risk of being “over-medicalized.” Palliative care has historically been delivered in hospitals, but Turn-Key sends nurses and social workers into the community to meet patients at home. That allows nurses and social workers to operate at the highest level of their license and they can bring in medical professionals when they need them, Turn-Key CEO Greer Myers said. LHC Group, which provides post-acute services including home health, hospice and long-term care, is developing post-acute bundles to manage patients across the care continuum. It chooses the highest quality post-acute providers for a narrow network and then aggressively manages the patient's care throughout the continuum including at home. Business is booming as health plans and risk-bearing providers seek lower-cost care. LHC has grown its net revenue from home health services to $783.5 million in 2017, an increase of 52.7% over the past five years. In April it completed a merger with provider Almost Family to form the second-largest home health provider in the nation with more than 31,000 employees and revenue of $1.8 billion. Home health services revenue from the largest provider in the sector, Kindred Healthcare, grew to $1.8 billion in 2017 from $173.2 million in 2013 after big mergers with companies including Gentiva Health Services and IntegraCare. Health insurers have been willing to shell out billions to control a piece of the home healthcare sector or scoop up other services directed toward the seriously ill. Anthem in June bought Aspire Health, a non-hospice community-based palliative-care company backed by Google Ventures that will allow the insurer to better serve very sick patients in the home. And Humana acquired large stakes in Kindred Healthcare and hospice operator Curo Health Services. UnitedHealth Group unit Optum's HouseCalls program has grown from an operation with 350 clinicians in 25 states in 2012 to more than 1,700 in 45 states and Washington, D.C. UnitedHealth's insurance arm in May said it had provided more than 5 million in-home care visits to patients through HouseCalls since 2012. 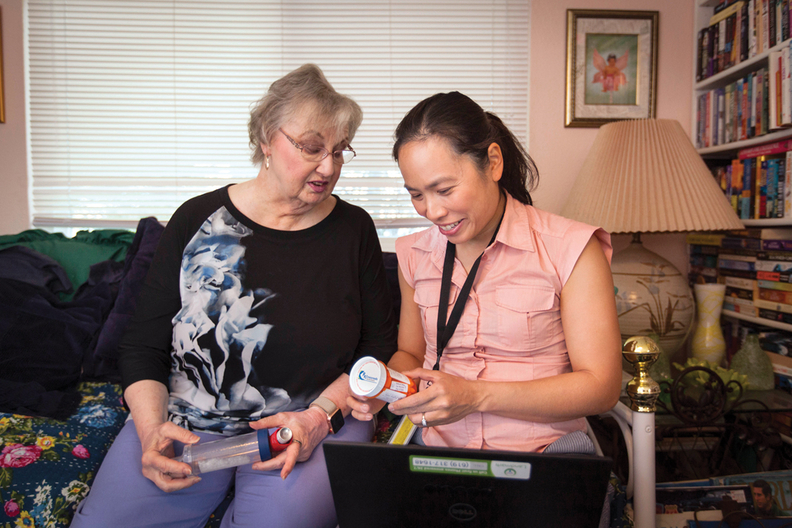 The potential cost savings from caring for a patient in the home are enormous, experts say. In 2015, the average Medicare payment per home healthcare episode was $2,742, whereas Medicare paid $18,361 per stay at a skilled-nursing facility; $19,116 at an inpatient rehabilitation facility, and $40,718 at a long-term acute-care hospital, according to the Medicare Payment Advisory Commission. “The cost and the quality of care delivered in the home is generally more efficient and effective than care provided in an institution,” said Edo Banach, CEO of the National Hospice and Palliative Care Organization. Various studies have shown that home health visits can help reduce hospital admissions and ER visits. A 2017 study by Indiana University's Center for Aging Research and the Regenstrief Institute found that patients who received home health visits after being discharged from a skilled-nursing facility were less likely to be readmitted to the hospital within 30 days than patients who visited an outpatient provider after discharge. Moreover, it's what patients want. Older Americans overwhelmingly prefer to receive healthcare at home instead of going back and forth to the hospital, surveys have shown. Most would also prefer to die at home instead of in a hospital bed, though that doesn't often happen, according to research by the California Health Care Foundation. Providing care at home hasn't always been an option. While home healthcare benefits are common in some state Medicaid programs, only in recent years have Medicare and its privatized counterpart begun recognizing their value for a population beyond the homebound. Following several home healthcare demonstrations and initiatives, the CMS wants to move home healthcare toward a value-based model and in July proposed paying home health agencies for 30-day periods of care instead of 60-day periods and removing the number of therapy visits from the payment determination, as called for by the Bipartisan Budget Act of 2018. The changes are meant to discourage home health agencies from providing more care than necessary and reduce the administrative burden. Moreover, the CMS proposed allowing providers to include remote patient monitoring as an allowable expense in their cost reports. More than 12,300 home health agencies provided 3.5 million Medicare beneficiaries with home health services in 2016, according to data from MedPAC. The CMS spent about $18.1 billion on home healthcare services that year. Medicare Advantage, the privatized version of traditional Medicare, in 2019 is removing some barriers that limited how far plans could go in tailoring care for seniors and making it easier for Advantage plans to provide in-home support to help patients with activities like bathing, dressing and cooking—and will even deliver meals to the home. A change allowing Advantage plans to vary cost-sharing for certain patients when they access high-value providers would allow plans to expand access and coverage while removing barriers like copayments and deductibles for people with chronic illnesses, said Torrie Fields, senior manager for advance illness and palliative care at Blue Shield of California. Plans will also have the leeway to include in their bids home-based palliative care to relieve the symptoms of terminally ill patients who are predicted to live beyond six months. That means nurses and social workers who contract with Advantage plans would be able to provide palliative care at a patient's home—something not billable under traditional Medicare. Traditional Medicare also does not pay for care in the home unless a patient is unable to leave. The CMS said some plans are already taking advantage of the flexibility. About 270 Advantage plans opted to provide 1.5 million seniors with some of the new supplemental benefits next year, including in-home support services, home-based palliative care, and adult day-care services. Those that did provide non-skilled home healthcare before weren't able to market and compete on it or pay for it with CMS dollars. Paying for the benefits had to come out of a health plan's administrative budget. Martin's Point Health Care, a not-for-profit organization in Maine with a small Medicare Advantage plan serving about 45,000 seniors, launched an in-home care program about a year ago for patients who are elderly and frail. Martin's Point sends nurses to patients' homes monthly to ensure they take their medication properly, evaluate the risk for falls, and screen for abuse and neglect, said Dr. Jonathan Harvey, the organization's chief medical officer. The nurses also assess food security issues and behavioral health needs and then connect patients to resources that can help or set up appointments with primary-care doctors or specialists. About 170 patients are enrolled in the program and early results show a significant reduction in ER visits and unnecessary hospitalizations. Harvey said the increased flexibility surrounding Medicare Advantage supplemental benefits would allow Martin's Point to potentially expand its home-care program, but the insurer is waiting to expand benefits until it gets a better understanding of the regulations and its population's current needs. Experts expect more plans to tap into the Medicare Advantage flexibilities in 2020 and beyond. As the population ages and Medicare spending rises, home health benefits will become widespread, offering a chance to improve patients' quality of life while reducing costs for the system as a whole. “When a model of care is fully responsive to one's goals, values and wishes and objectives in care and life, they tend to receive higher-quality care in the home, the setting of choice, and just as a bonus it tends to save money because you are avoiding hospital admissions that the person didn't want in the first place,” MacPherson said.